Preheat the oven to 400°. In a medium saucepan, combine the chicken stock with the tamarind pulp, vinegar, garlic, ginger and chile and boil over high heat until reduced to 1 cup, about 15 minutes. Strain the sauce and stir in the honey. Bring a large saucepan of water to a boil. Add the noodles and cook until tender; drain. Spread the noodles on a large rimmed baking sheet and pat dry. In a large nonstick skillet, heat 2 tablespoons of the oil until shimmering. Add the noodles in an even layer and press with a heavy lid. Cook over moderately high heat until browned and crisp on the bottom, about 10 minutes. Invert the noodle pancake onto the baking sheet. Add 2 more tablespoons of oil to the skillet and heat until shimmering. Carefully slide the noodle pancake back into the skillet and replace the lid. Cook over moderately high heat until browned on the bottom, about 8 minutes. Meanwhile, in a medium ovenproof skillet, heat the remaining 1 tablespoon of oil. Season the chicken thighs with salt and white pepper. Add them to the skillet, skin side down, and cook over moderately high heat until the skin is crisp and golden brown, about 4 minutes. 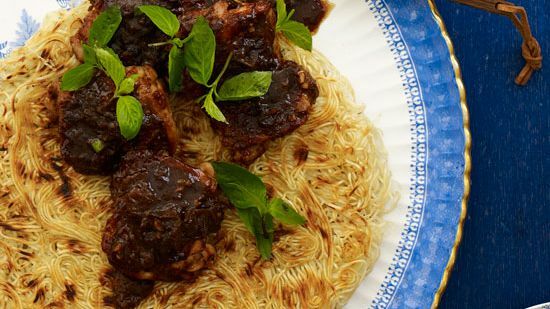 Turn the chicken skin side up, pour in the tamarind sauce and bake in the oven for about 10 minutes, basting once, until the chicken is cooked through. Remove the skillet from the oven and preheat the broiler. Transfer the chicken to a plate. Boil the sauce until thickened, about 3 minutes. Return the chicken to the skillet skin side up and baste well. Broil about 4 inches from the heat for about 3 minutes, until nicely glazed. To serve, cut the noodle pancake into wedges and transfer to plates. Top with the chicken thighs and sauce, garnish with the basil leaves and serve. The tamarind sauce can be prepared through Step 1 and refrigerated for up to 3 days. Tamarind pulp is available at Asian and Latin American markets. "The slightly sour tamarind chicken is great with the gentle flavors of a dubbel (a malty ale) like Maredsous 8," Yoon says.